Oooh have I got a recipe for you today! A good one! But first, since it’s “vegetarian week,” let me touch on the meals prior to dinner. Veggie Lunch #3 – Today we had lunch catered at work, due to some visiting faculty members. Luckily, our group is pretty veg-friendly when it comes to ordering food, and there was a vegetarian tray to choose from. Yay for free Zingerman’s! So for lunch I had half of a sandwich packed with artichoke hearts and roasted red pepper on hearty hummus-slathered bakery bread, a small scoop of potato salad, a PiCKLE (duh – picklez is my thing), and an oh-so-luscious brownie triangle. This is definitely my favorite veg-recipe of the week so far! Well, on of my favorite new recipes, just in general. I was not prepared for how tasty these wraps would be! Here is the link to the recipe from EatingWell.com: Creamy Avocado & White Bean Wraps. 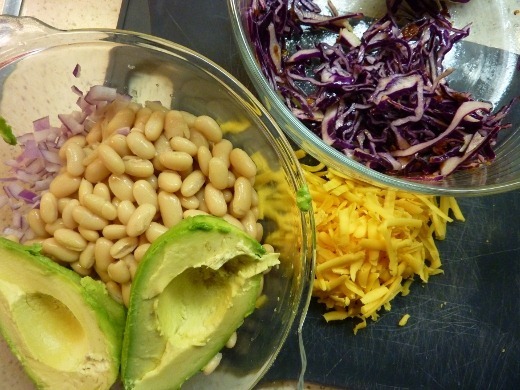 Lots of wholesome ingredients: avocado, cannellini beans, onion, sharp cheddar. Red cabbage and shredded carrot dressed in cider vinegar, oil, salt, and minced chipotle in adobo sauce. The avocados were mashed with the white beans, and onion and shredded cheddar was mixed in. 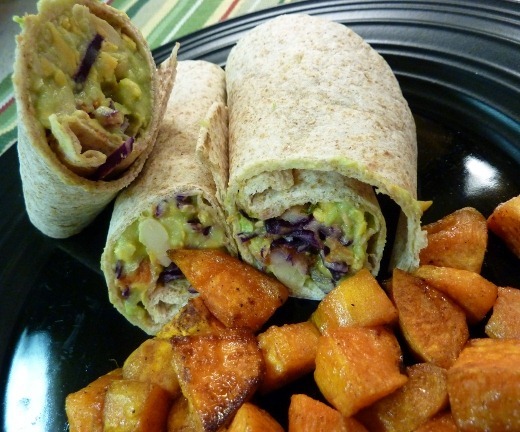 Each wrap, made with a whole wheat soft tortilla, received a healthy scoop of avocado filling and a handful of dressed cabbage and carrots. These wraps were truly wonderful, and so easy. No cooking required! I highly recommend this recipe. Full of protein, fiber, calcium, healthy fats, and vitamin-rich veggies. Even the hub loved them! I served them with a side of oven-roasted sweet potatoes, dressed in EVOO, S&P, brown sugar, cinnamon, and dried ginger before baking in a 400 F oven for 30 minutes, flipping once. I’ve been feeling really good about follow a vegetarian diet so far this week! Granted, it’s only been three days, but I’ve been feelin’ good. I don’t necessary intend become a vegetarian (I wouldn’t say it’d never happen though; it’s possible – but I WILL say I will could/would never be able to become vegan because I couldn’t bear to give up cheese! Ever. EVAR! ), but would like to eat less meat – for several reasons: health, ethical, social…I won’t really get into it. I would take one of these wraps over a slab of meat ANY day. Fo sho! I have been sneezing up a storm this evening and have felt utterly exhausted today. I hope all I need is a good night’s sleep! I’ve been staying up too late. Tsk tsk. And PHEW… that ride home tonight was HORRENDOUS. Took me an hour to get home and it typically only takes 15-20 minutes. GAH. I can’t believe it’s on Tuesday. GAH! Word of the Day: Gah. Pingback: Vegetarian Week – Day #5: Black Bean Taco Pizza « Meg.Goes.Nom.Nom. Pingback: My First Green Monster « Meg.Goes.Nom.Nom. Pingback: Dinner Meal Plan for October 13-19 | Meg.Goes.Nom.Nom. Pingback: Dinner Meal Plan for October 20-26 | Meg.Goes.Nom.Nom.